A few products are announced before the show, so on Tuesday I found myself gathered with fellow London photographer-bloggers to hear the latest and greatest from the good folks at Canon. 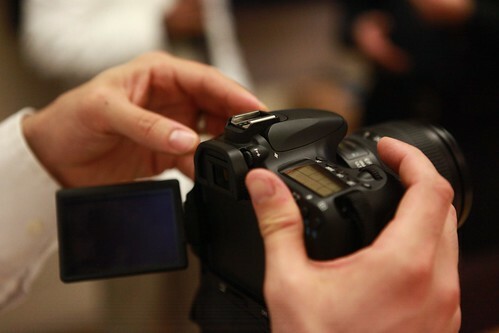 I saw the new Canon PowerShot G12, very nice, the S95 (I loved the S90, the S95 is even better), and the 60D. Ah, 60D, wherefore are thou 60D? You come to steal the hearts of those who would by a 7D, but have not the cash, and to tempt the wallet of the would-be 550D purchaser. After playing with the 60D, and looking through the features, I literally got my credit card out. No joy. It’s not available for purchase just yet. A long few weeks to wait first. What’s so good about the 60D, and why does it tempt a 5D Mark II owner like myself? Very simple: I’m in the market for a second body, something a bit smaller (and less valuable!) to have on standby. The 60D isn’t a cheap DSLR – Canon cover the bottom end with their 1000D and the 550D (which I have on loan at the moment – more on that soon). It isn’t top priced either. If you want to spend big bucks in the semi-pro space there is the 7D, or for big big bucks, the 5D mark II. The settings dial has a lock button – you press the button to enable the rotary switch that sets Av, Tv, Auto, etc… If you are constantly thrusting your camera in and out of your bag, this is a shot saver. It’s so easy to knock the dial. On the 1D (my pro body) there is no dial to knock – you press and hold buttons to switch modes, but on most mid-range bodies (nearly all makes) settings are usually controlled by a dial that is all to easy to knock out of position, loosing you the shot you were about to get. Lock button = win. Pop out screen. But a pop out screen that can rotate 180′ and flip over to the side of the body, as it is side-hindged. That means you can self-shoot and still see the screen. Very useful for video bloggers and weird shots (not just party folks! ), or grabbing a shot of yourself in front of that movie star ;). Win #1. Win #2 is that you can flip the screen in toward the body when you put it away, so that the glass is tucked away, with the back of the screen facing out. No more scratches on the viewer screen. Excellent! The screen is 1,040k – very high resolution. Takes SD cards (with support for SDXC). I like compact flash cards, for their speed, robustness and the fact they don’t get so easily lost. BUT using SD cards means you can use an Eye-Fi directly (which the newer Canon models recognise and have menu control for). The enables you to shoot and upload straight to Flickr or elsewhere on the web directly from the camera, where is an open WiFi access point. I did this for the shots at BT Tower on Wednesday. Great workflow – publish in real-time, with no wires. 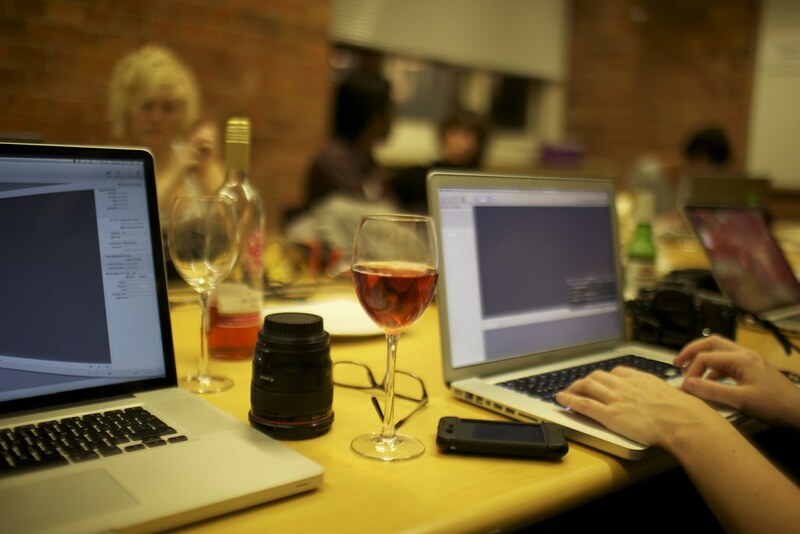 The 60D also enables you to edit the images on camera, including raw processing. Very neat. Takes the same battery as the 5D Mark II. That means I can re-use/pool my batteries. The 5D Mark II battery is a serious beast. I usually don’t take a charger with me on shoots or trips, the battery lasts the duration, so no need. Good weather proofing (better than the 50D), here it is shooting in the rain. See how wet that is? No problems. Now, it isn’t the 7D. It shoots at a slower 5.3 frames per second and the ISO range is 100-6400 (with a high mode of 12800). BUT you can buy LOTS of beer with the cash difference between this and a 7D (at the moment street prices for the 60D aren’t out, but it’s going to be in a different bracket to the 7D. There are some other neat little features, like an electronic level on the display, and creative filters and selectable crop size. Sorry if I’m sounding a bit gushing. As I said, I got my credit card out. For someone who shoots and edits on the go, who wants a semi-pro DSLR, this is a formidable piece of kit. It certainly got my attention! 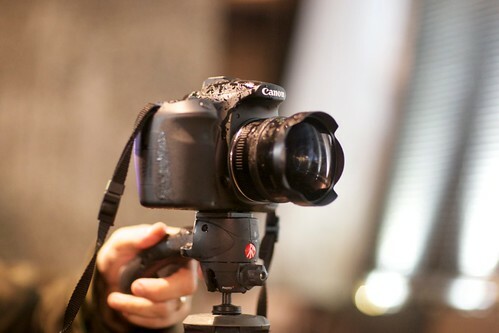 The wonderful Ilicco asked which to get – the 7D or the 60D. Not so simple answer: If you are budget constrained, the 60D is for you. If cash is less of an issue, and absolute top quality is king, the 7D (or 5D mark II). I’ve got the top end covered with my 5D mark II, so the 60D is looks a very interesting potential second body / travel companion.